“A sustainable process for producing diverse natural products using renewable resources is of great interest. This study represents the development of a robust and efficient malonyl-CoA biosensor generally applicable to a wide range of industrially important bacteria. The capability of this biosensor for screening a large library was demonstrated to show that the rapid and efficient construction of high-performance strains is feasible. This research will be useful for further accelerating the development process of strains capable of producing valuable chemicals to industrially relevant levels,” said Distinguished Professor Sang Yup Lee of the Department of Chemical and Biomolecular Engineering, who led the research. This study entitled “Repurposing type III polyketide synthase as a malonyl-CoA biosensor for metabolic engineering in bacteria,” was published in the Proceedings of the National Academy of Sciences of the United States of America (PNAS) on October 02. Figure: Type III polyketide synthase (RppA) as a malonyl-CoA biosensor. 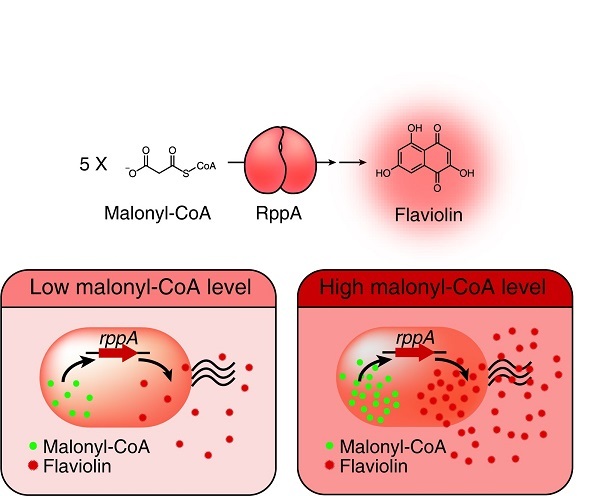 RppA converts five molecules of malonyl-CoA into one molecule of red-colored flaviolin. This schematic diagram shows the overall conceptualization of the malonyl-CoA biosensor by indicating that higher malonyl-CoA abundance leads to higher production and secretion of flaviolin, resulting in a deeper red color of the culture. This system was employed for the enhanced production of four representative natural products (6-methylsalicylic acid, aloesone, resveratrol, and naringenin) from engineered E. coli strains.